With medical marijuana legal in nearly half of the U.S. and recreationally legal in two states, I think it's time we discuss your smoking habits, my pothead friends. While getting stoned used to be associated with teenagers who love Bob Marley and adult burnouts in tie-dye, the face of the average pothead has shifted. Many pot smokers nowadays are your average, clean cut, responsible adults. We hold down jobs, raise happy kids, and pay our bills on time! So why are we still smoking out of phallic rainbow colored glass and storing our pot in old jam jars? Lets upgrade into the world of smoking like the classy adult you are. In this post, I'm going to focus on the hardware. I will do a follow up post on storage and other accessories in the near future. First thing's first: Try not smoking out of a pipe at all and get a vaporizer. This is by far the healthier alternative to smoking, as combustion of weed will eventually lead to a host of negative effects on the respiratory system, and inhaling damaging carcinogens will irritate your windpipe as well as your lungs. Vaporizors will not burn buds, instead they heat up the cannabinoids on the buds to a boiling point where it is then turned into a vapor mist that you inhale. This is why vaporizing is the preferred choice by doctors in places where marijuana is legal, and ranks highest in satisfaction in terms of minimizing side effects. So lets take a look at some nice options in the vaporizer world. First off, the Pax by Ploom ($249). This pocket sized piece is so aesthetically pleasing, you could leave it out on your coffee table and it would fit right in with the rest of your electronic gadgets. The Pax has a motion sensor with automatic shut off to save your battery and three temperature presets so you can adjust it to your needs. If you are comfortable with having a larger piece out at home, the Volcano ($539 with valve) will fit in right next to your kitchen blender. This has long been the top choice among those who vape, though I will warn you that inhaling out of an inflated bag does look a little silly so YMMV. A third option based on appearance alone is the Iolite Whispr 2 ($169) which looks like a mini tape recorder or portable radio. Remember tapes and mini radios? The silicone mouthpiece is folded into the side, and the piece is butane powered (nothing to plug in or charge up) to ensure a quick and even heat. Fair warning, this piece doesn't have the best reviews because it lacks temperature control and there seems to be a higher margin of error in manufacturing, but overall those who have had success using it are over the moon about this little box. Don't have the money to invest in a vaporizer or just prefer to smoke out of a glass pipe or bong? Not a problem! There are plenty of mature looking options on the market now that you should consider. My personal preference is to stay with simple design and solid material. The key here is to make it look like it belongs in your place and not stick out like a sore thumb, so when your mother comes over and sees it hidden in a cabinet while searching for your plates she may not even notice it. This Fritted Disc Oil Rig Water Pipe ($89.99) is made of durable 4-5mm glass with a honeycomb diffuser. This model also comes with an oil dome should you prefer smoking oil concentrates rather than buds. The angular lines make it look like something out of a science lab more than a meth lab. Please note: I will never condone smoking meth. Just saying, don't do it. Ever. Another beautiful alternative is this Volcano Bong ($39.99) in matte black. A grip ring towards the bottom of the bong allows for easier handling and comes with a clear glass slider. For the price, it's a reasonable elegant looking piece. I have to say, it took me a while to find a bubbler pipe that did not look utterly ridiculous. They all look like glass blowing experiments gone awry and should be considered the tween of the smoke world. It's not a pipe, not yet a bong; it's the marriage of two things into one awkward pipe with dangly bits. I'm sorry, bubbler fans. If you would like the convenience of a pipe with the smoke cooling effects of a bong, might I suggest a Zobo Water Pipe ($7.99). These little water pipes come with everything you need and come in either gold or silver. They remind me of perfume atomizers in design and will probably make you feel like the caterpillar in Alice in Wonderland (Yes, I know he's smoking a hookah, but I digress). I purchased one for a friend's birthday, and it came in an elegant velvet lined box and a picture of a handsome man smoking on the back. The instructions are all written in Chinese, but common sense and pictures will show you how to operate it. And now for the most common piece that smokers use: the pipe aka the spoon. 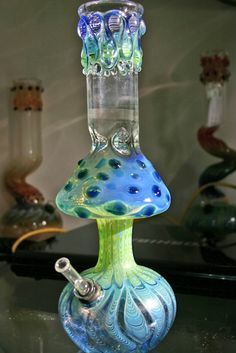 These, almost even more than a bong, can get pretty out of hand when it comes to design. But there are plenty of small beautiful pieces to consider if you are looking for a nice upgrade. I didn't start smoking until well into adulthood, so when I made my first pipe purchase, it was a priority that a) it didn't look too phallic, and b) I didn't look incredibly stupid holding it up to my face. This Emerald Green Sandblasted Pipe ($18) passes both of my tests. With such a simple design in frosted or clear emerald, it looks and feels like a grown up pipe. The Etsy seller of this pipe also has other color options in the same design, and each one is gorgeous. This Apple Glass Pipe ($35 $45) is as silly as I'm willing to go, but it would fit in with any knickknacks on a shelf. And it's a sweet and clever callback to creating pipes out of actual apples, but without the sticky mess. And there you have it, some really nice pieces that will make your smoking experience a little more sophisticated. Stay tuned for part two, where I will find you something much nicer to store your pot in, so you can put that jam jar in the recycling bin once and for all. One last note: these posts are 100% not sponsored by anyone and I am getting paid a grand total of $0 to endorse anything. It tickles me greatly to think you think I'm making any money off of this. Top image via PuffPuffPass.net.